Experience collaboration like never before! Collaborating online has never been this engaging. Jump into a meeting instantly from any channel, or invite a team member into your personal office. Conference call with audio, video and text chat. Pin documents, share images, video and 3D. Decorate your team space together. Customize your avatar to your own personal style. Add moot to your Slack for social meetings. Every Slack channel has its own room. Every Slack user gets their own private office. Join on mobile, tablet, laptop/desktop or VR/AR. 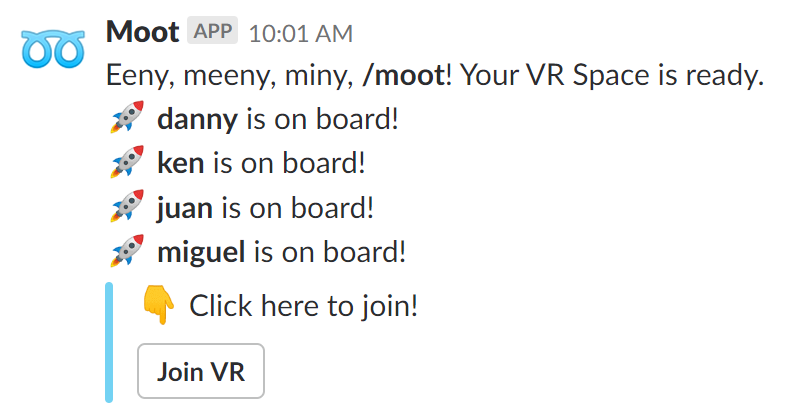 Type /moot in any Slack channel to meet with your team. Ready To Collaborate Like Never Before?